A while back, when M was tiny, I tried to indulge in crochet whilst she was asleep in my arms. This worked well until I was forced to return to work and suddenly found that all time was at a premium meaning there was and is very little for myself which effectively stopped all craft related activity. I'm sure this ongoing hard slog is not good for me but there is no sign of things letting up. In fact with the recent redundancies at work I suspect things are set to get worse. In an effort to distract myself, I've been trying to make small projects again and came across a block a month CAL on Ravelry. The idea is to make one block a month throughout the year and after twelve months, join all the blocks together to make a blanket. Block patterns are offered in either six or twelve inch squares and I thought I'd have a go at the six inch ones... Mostly because I really don't have the time available to be ambitious and I wanted a project which is achievable. Decision made, I started the January block in March with lots of enthusiastic help from M.
Now that I'm back at work I find I have so very little time to spend with my baby girl that I prefer to spend as much of the time that I have got in her company as I can. This means for me to indulge in any hobby type activities I need to be able to do them around her. M wants to be involved in everything I do and so I anticipate her joining in, choosing my yarn accordingly and providing a chunky hook for her to wave. M's natural tendency is to mimic and so she 'll study what I'm doing intently before happily prodding the yarn with the hook. 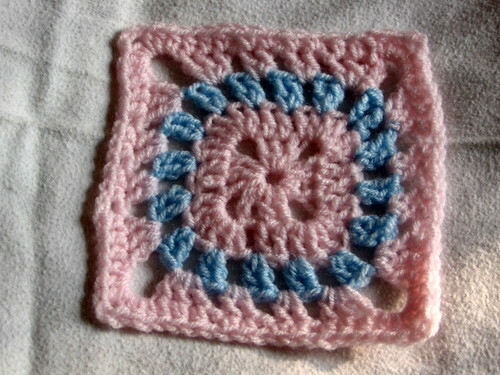 The January block goes by the name of Smoothfox's Flower Button Granny Square, designed by Donna Mason-Svara AKA Smoothfox. The pattern itself uses American notation and is very clearly written making it easy to follow. 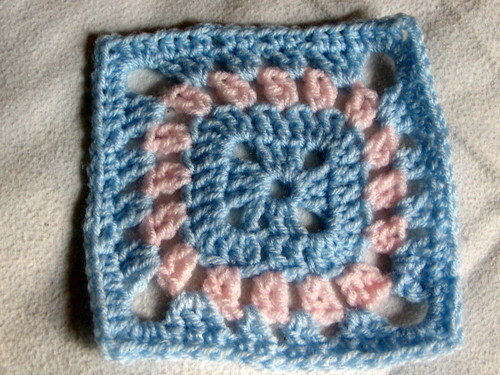 I chose to use two colours rather than the three specified in the pattern working in a standard baby DK on a 5.5mm hook. 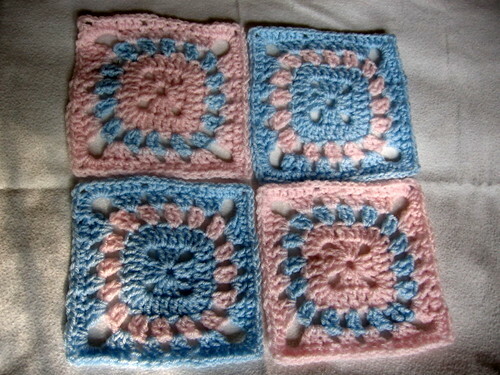 In one month I managed to make four squares which is quite an accomplishment for me at the moment! Glad that you have managed to fit in some making it's good for you. Ed decided that my yarn was a bandage a couple of days ago and wrapped it all over his hand and indeed round his tummy before telling me it was all better now then wandering off through the kitchen trailing yarn ! Good job it was a small end of scrap ball as if it had been a full ball I might still be trying to untangle it now !